Be the first to share your favorite memory, photo or story of Rosemary "Rosie". This memorial page is dedicated for family, friends and future generations to celebrate the life of their loved one. 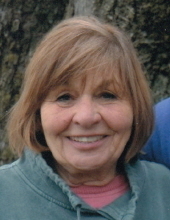 Rosemary (Rosie) Irene Bultman Meyer passed away peacefully on March 30th, 2019 in her home, surrounded by loved ones, after a battle with cancer. She was born on September 3rd, 1937 to Tony Sr. and Vera (Haack) Bultman, in their home in Kewaunee. Rosie was a naturally curious child, who enjoyed finding adventures in the world around her, and walked through life with a song in her heart. Rosie loved her childhood time spent on her family’s farm and orchard. She first attended Pleasant Hill (one room schoolhouse), and later attended St. Mary’s School and graduated from Algoma High School. She married John Julius Meyer on September 15th, 1956, and together they had three daughters and two sons. Rosie had a knack for taking care of those around her, particularly the very young and old. It was this natural gift of care-taking that led her first to being a “candy striper” in high school, and later to a nursing career at the Algoma Memorial Hospital. In her free time, Rosie could often be found tending to her gardens, and many neighboring gardens as well. A free-spirit, she loved to ride her bike around town, visiting her friends and family. She became known as “Grandma Rosie” to many children in the community, and always made it a point to leave others feeling better than when she arrived. Together, Rosie and John enjoyed skiing in Colorado, and cheering on the Packers, Badgers, and Brewers. Rosie especially loved playing trombone with the Algoma Community Band. A highlight for Rosie during this time was traveling throughout Europe, touring with the Community Band. Rosie was loved by all those who were lucky enough to know her for her quick laugh, bursts of song, and one-of-a-kind personality. Rosie is survived by her husband John, children Mary (Mike Lardinois) Gregerson, Dottie (Gary) Klaczko, Mike (Debbie) Meyer, Jan (Sheree) Meyer, and Bob (Angie) Meyer. Rosie is also survived by her grandchildren Bill (Kelly) Gregerson, Tony Gregerson, Krissy (Michael) Horst, Richard Meyer, Greg Meyer, Jeff Meyer, Kelly (Justin) Gauger, Katie Deprey, John Meyer and Dakota Meyer, her five great-grandchildren Emmett & Stella Gregerson, Almerik & Asher Horst, and Kailey Gauger, siblings Margie Naze, Jeanne DeDecker, David Bultman, Cathy Antonissen, and Tony (Theresa) Bultman, and brothers-in-law David (Donna) and George (Karla) Meyer. Rosie is reunited in heaven with her father, Tony Sr, and her mother, Vera, with whom she held a very special relationship. She is also preceded in death by brothers-in-law Joe Antonissen and Lee DeDecker, and sisters-in-law Dawn Bultman and Carol Bultman. She will live on forever in their hearts. Family and friends will gather at the SCHINDERLE FUNERAL HOME, Algoma, Monday April 15, 2019 from 4 PM – 8 PM and after 9 AM Tuesday at St. Mary Catholic Church until the Mass of Christian Burial at 11 AM with Fr. Alvan Amadi officiating. Burial in the church cemetery at a later date. Special thanks to the staff of Unity Hospice and those in the community who showered Rosie with cards, letters, gifts, and visits. Rosie’s children are grateful to Rosie’s special friend Gail Elsholz, along with her husband Ralph, who looked after them and helped out in so many ways while they were caring for their beloved mom. Thank you to Reverend Al Briggs for transporting our dear dad home to visit with mom for a special last time together. Loving thanks to our life- long friend, Laurie Schinderle, for her tender and respectful handling of our precious mom. Express your sympathy, memories and pictures on Rosie's Tribute Wall at www.schinderle.com. To send flowers or a remembrance gift to the family of Rosemary "Rosie" Irene Meyer, please visit our Tribute Store. "Email Address" would like to share the life celebration of Rosemary "Rosie" Irene Meyer. Click on the "link" to go to share a favorite memory or leave a condolence message for the family.